Valentine’s Day is all about my loves… my husband, two beautiful children, and food. Let’s put a pause on all the red dyes and hard candies and spoil ourselves (oh… and our special someone too) with a gorgeous, satisfying, and I-can’t-stop-myself-from-eating breakfast. 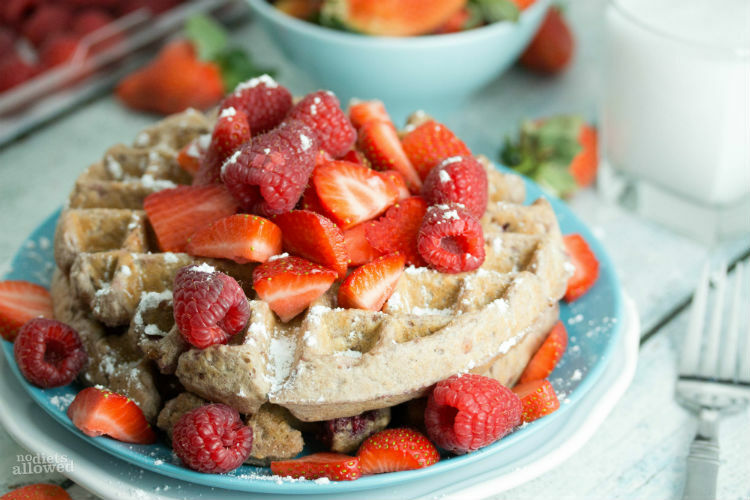 I made a couple batches of these Raspberry Waffles, ya know, just to make sure they taste as good the tenth time as they did the first. Spoil alert: They did. Okay, let me talk about my food crushes. I absolutely ADORE fresh fruit and breakfast foods. I’ve been known to flirt with muffins behind my waffle’s back, but my new Belgian waffle iron has only magnified my infatuation with waffles. I just use some olive oil in my Misto Olive Oil Sprayer and pour on some of my favorite batters like my Multigrain Waffles or my Banana Waffles. I usually double my batch and refrigerate the leftovers just so I can make fresh waffles for a few mornings in a row. 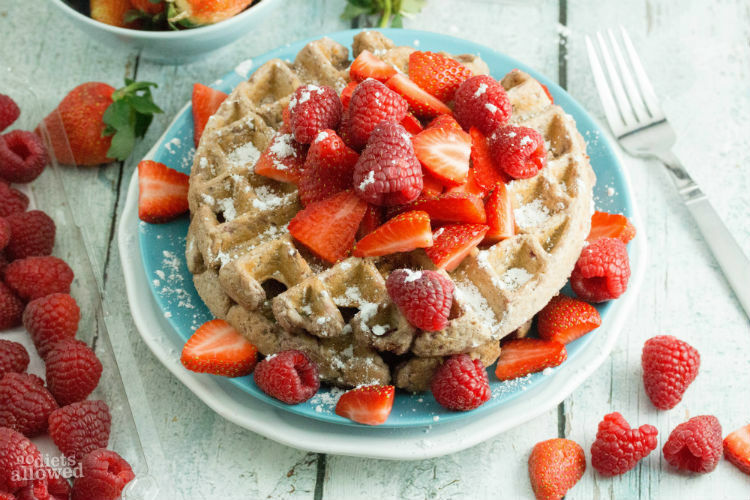 I have discovered a few must have ingredients in order to make waffles, muffins, and other baked goods light and fluffy while sneaking in some solid nutrients. The first is whole wheat pastry flour. It prevents your whole wheat items from turning into dense bricks! It has all the benefits of whole wheat, but keeps everything light and fluffy. Also, you must invest in a bag of Flaxseed Meal and Chia Seeds. They are power grains packed with protein, fiber, and Omega-3s and you won’t even be able to taste them! Like I said, I’m all about sneaking health into tasty things and throw them in several of my recipes. Let’s talk about toppings. 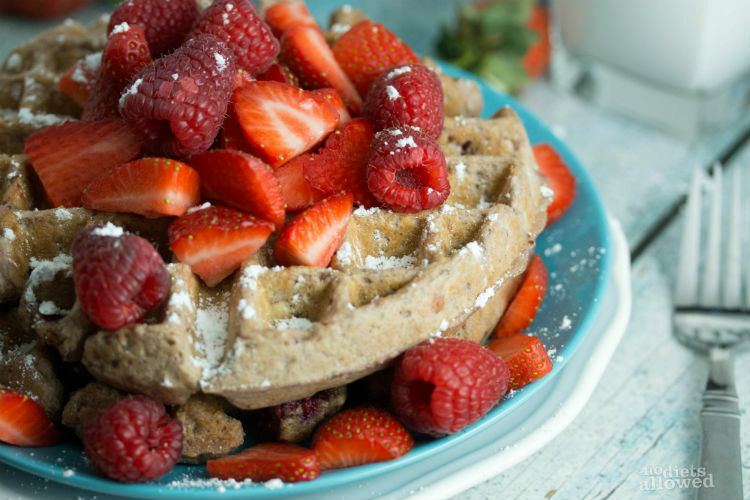 Don’t insult these Raspberry Waffles by throwing on lots of artificial, nutrition-poor toppings. I highly HIGHLY recommend spreading on some coconut oil on a warm waffle instead of butter. 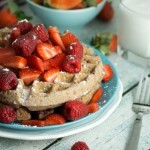 Then generously throw in some sliced strawberries and raspberries followed by some pure maple syrup. When choosing maple syrup, read the ingredients! It should only say pure maple syrup not a list of artificial ingredients and dyes. I’m passionate about reading all ingredients on prepackaged foods and making sure I know what I’m eating. Read the ingredients, my friends. You’ll be amazed at what junk is getting slipped into our foods. Happy Valentine’s Day! May you and yours be showered with love. In a large mixing bowl, combine flour, oats, flaxseed, chia seeds, and baking powder. Mix well. Add milk into dry ingredients and stir until batter is moist. Fold raspberries into the batter. 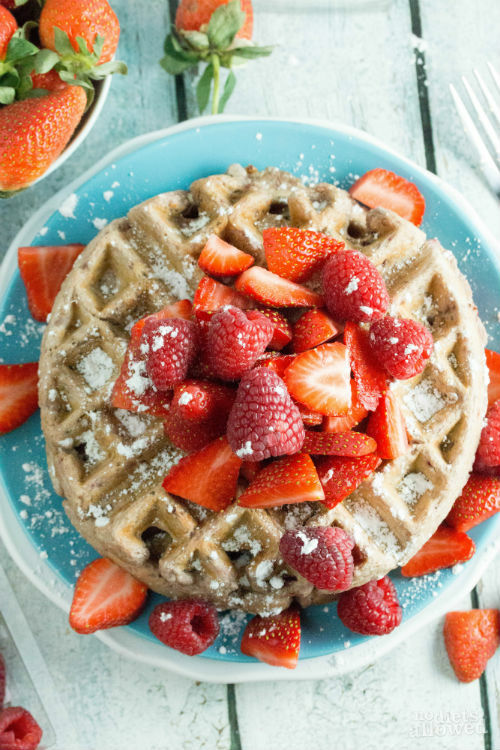 On a heated waffle iron, spray with olive oil cooking spray. Pour about 1/2 cup mixture into center and cook to preference. Spread on coconut oil and top with fresh strawberries and raspberries. Pour about 1 to 2 Tbs of pure maple syrup on top. Enjoy!